Have you ever tried ruler work on your domestic sewing machines? So what exactly is ruler work? This is a long arm technique for use on a stationary machine, whether that's a regular sewing machine or a sit-down long arm. For this class a Janome 6 piece ruler set is required. If you do not already own the set, we will be happy to order one for you. 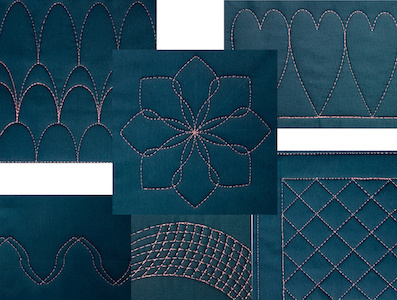 You will have a chance to practice on each ruler before stitching on a main piece of fabric. The fabric will then be turned into a template folder for holding different templates. If time permits, you will assemble the folder together in class. You will have written instructions on how to use the ruler as well as putting the project together at home. Sam has been with Janome for nine years but he has been sewing for the past thirty-nine. Prior to joining Janome, Sam had his own custom sewing business in Texas where he designed and made wedding gowns, bridesmaids dresses, home décor, costumes, hats and pretty much anything that can be sewn. He has taught sewing to both children and adults - from beginning to advanced techniques. He also spends time volunteering in the summer, teaching Girls Scout troops sewing so they can earn their Textile Badge. Sam loves all sewing related gadgets and probably has every notion ever made, some still in their original packaging. When Sam is teaching a class or talking to fellow sewists, it is evident that he is passionate about sewing and teaching it to others.